There are few better feelings than gently waking up on your own — no blaring alarm, no pets whining, no kids playing loudly — after a solid eight hours of sleep. Right? Losing out on deep, restful sleep can impact your body in many ways that extend beyond your energy levels throughout the day. Sleep affects the body physically, in terms of things like weight loss or gain, insulin production, heart health, skin health, and immune system function. It also impacts your body mentally. Sleep plays a role in everything from memory to mood. While one night of poor sleep might not leave you feeling too different, ongoing sleep deprivation can affect memory and reaction times in similar ways to being drunk. Suffice it to say that essentially every system and process throughout your body relies on getting enough sleep to keep functioning well. You may have seen articles on all the ways certain habits can impact your sleep. For instance, if you like to read the news on your smartphone or tablet just before bed, that screen time may affect how quickly you can fall asleep. In order to help your body adjust to sleep quickly, there are a number of habits to break or take up. But, before getting into that long list, one of the most important things you can do is assess how you sleep. Your sleep position matters beyond simply feeling comfortable enough to drift off. 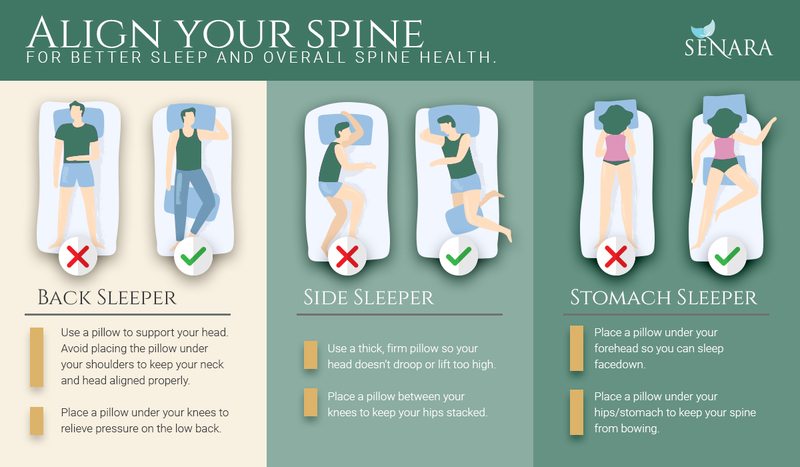 Your posture affects your spine and nervous system health even when you sleep, so choosing a sleeping position can have effects that start with your spine and extend throughout your body. Poor posture while you sleep can cause expected issues like neck and back pain, but it can also bring about digestion issues, breathing concerns like sleep apnea, blood circulation issues, joint pain, and more. To alleviate these symptoms and get better, more restful sleep, pay attention to your posture while sleeping. No, that doesn’t mean constantly engaging muscles to keep your shoulders back and your neck long. But there are a few things you can do depending on your preferred sleeping position to encourage better posture. When your positioning is correct, lying on your back is actually the best sleeping position for your body. It allows your head, neck, and back to rest and relieves the pressure on your spine, allowing it to decompress. For the best positioning, find a pillow that lifts your head somewhat. You want your head elevated enough that your esophagus is above your stomach to prevent acid reflux. However, you don’t want your head raised so high that it pushes your neck forward and causes your chin to curl down. Choose a pillow that fills the space behind your head and neck, allowing your spine to remain long. When you sleep, do not slide your pillow under your shoulders. If you have low back pain, you may also want to place a firm pillow under your knees to help your spine lay in one long line. This can help relieve the pressure on your low back and ease discomfort. Sleeping on your side or in a fetal position can be a great position for those who suffer from acid reflux or breathing issues. Snorers and those with sleep apnea should try to build a side-sleeping habit because this position helps keep airways open. However, side sleeping can only help those concerns when you’re in proper positioning. The common position issue for side sleepers is spinal misalignment at the hips, shoulders, and neck. If you sleep on your side, it’s even more important that you have a properly supportive pillow. A pillow that raises your head too high or one that doesn’t provide enough support means the vertebrae in your neck will be unevenly compressed to one side. This can lead to ongoing neck, shoulder, and back pain. The average adult head weighs 11 pounds, so you’ll want a firmer, thicker pillow provide sufficient support to hold your head up. You should also pay attention to hip alignment if you’re a side sleeper. Choose a mattress that is soft enough to allow your hips and shoulders to dip without your torso dropping down. If you need further help keeping your hips perpendicular to the mattress, place a firm pillow between your knees to provide that additional support. Sleeping on your stomach can be complex when it comes to proper spinal alignment. It can be difficult to get into a position that keeps your spine neutral. Stomach sleeping can also place extra pressure on muscles and joints. If you have ongoing joint aches or back pain, consider choosing a different position as one back pain treatment option. You can simulate a similar sensation to sleeping on your stomach by rolling to your side and holding a body pillow. However, if you find you just can’t get comfortable in any other position, there are a few things you can try. First, it’s important to try to keep the compression on your neck even. Invest in a firm pillow to place under your forehead (rather than under your whole head). This should allow you to lie face down instead of turning your head to one side or the other. The other common problem with stomach sleeping is that it encourages your stomach/torso to sink down below your hips and shoulders. This causes your spine to bow and can compress it or lead to alignment issues that cause back pain. Help keep your spine in one straight line by propping a pillow under your hips and stomach. Doing so can also help minimize how much tossing and turning you do at night, which is another factor that inhibits restful sleep. Adjusting your sleeping posture is just one element to caring for your spine and nervous system health. Chiropractors focus on whole-body wellbeing that centers on the spine, joints, and nervous system. Connect with your local chiropractor for more information on correcting your sleep posture, seeking natural back pain treatment, and more. Schedule your consultation with Senara Health and Healing Center & Spa in Peoria today.